The Frog Queen: Exclusive Interview with Carla Speed McNeil on Finder!! Exclusive Interview with Carla Speed McNeil on Finder!! One of my favorite comic book stories every is continuing in a new serial with Dark Horse Presents. You can imagine how quickly I sought to read Finder after learning of it's return! It was immediate and no sooner had I read it, I found myself online emailing author, illustrator and Finder creator Carla Speed McNeil about the resurfacing. She quickly emailed me back agreeing to answer my questions for you my dear readers! The new Finder story entitled CHASE THE LADY will debut in this month's issue of Dark Horse Presents, issue #15 out Wednesday October 21st. TFQ: Finder is back but for how long? 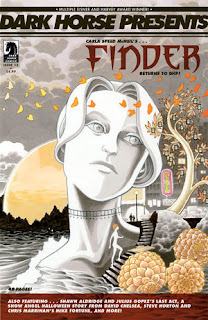 How many issues of Dark Horse Presents will we see the new Finder story? Carla: Currently, I have 96 pages of the next FINDER story, CHASE THE LADY, drawn and ready to go. That's a little more than half of the new story, and a year's worth of episodes for DARK HORSE PRESENTS. TFQ: This first part of the serial focuses on a mysterious religious event. Can you give us any hints about what is going on in this introduction? Carla: The first episode of CHASE THE LADY depicts a moment of spiritual crisis for a high official of one of Anvard's many faith organizations. From the perspective of the main character of CHASE THE LADY, it's just the reason for a major traffic snarl. TFQ: Can you tell me a little about where the plot is going and whether we will see some familiar faces? Carla: This next book returns to Rachel. CHASE THE LADY is my attempt at an Edith Wharton novel, in that Rachel is now a penniless aristocrat who needs to marry a suitable person-- suitable here meaning one with enough zeroes after the 1 and the 7 in her bank account. TFQ: Every time a Finder story ends, I fear it may be the last. What makes you continue to resurrect Finder? Carla: I'm not in any rush to end FINDER. I set it up so that I could tell nearly any kind of story I wanted to. VOICE and 3RD WORLD and CHASE THE LADY are all part of my attempt to get into the guts and bones of this world, to show the whys and what-happeneds, because this isn't post-apocalyptic fiction, it's post-post-post-post-apocalyptic. What Happened happened so long ago that nobody even thinks about it anymore; they just put everything back together all wrong and now no one remembers the world ever having been any different. TFQ: Is it difficult to revisit each time or the opposite? What is it like for you personally each time you begin a new story arc? Carla: It's never hard to get back into FINDER. It's basically a snapshot of the inside of my head, and exists to keep me from getting bored. I'm horrible when I'm bored. So it may be that I step aside from time to time to tell other stories, work with other people, but right now I have no plan to stop doing stories set in the FINDER scenario. As long as I think I'm still learning and have something new to bring to it, it will still be alive in my mind.